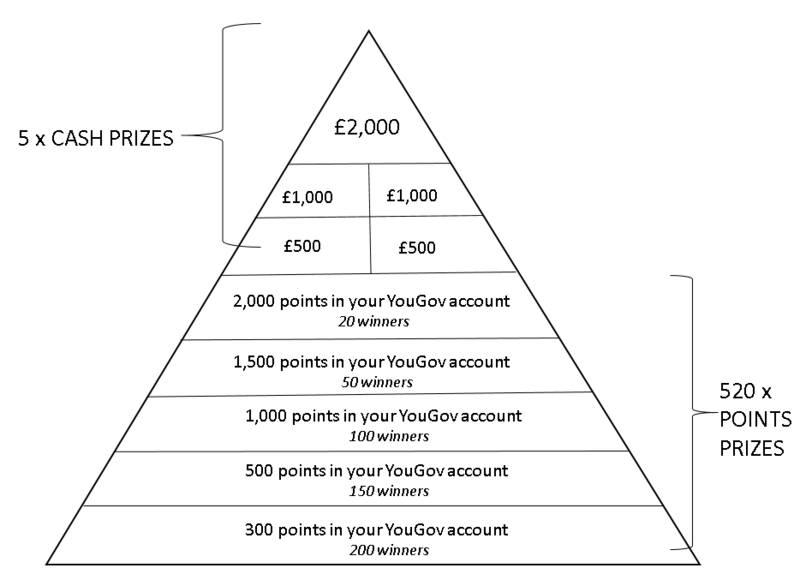 Enter points into the YouGov monthly prize draw and you stand the chance to win one of 100s prizes of either cash or points. Simple as that: we’ll be giving away £5,000 in cash prizes each month, and LOTS of points prizes to boost your YouGov balance, helping you towards your next cash reward from YouGov. Remember you only need to enter 1 point to receive 1 entry into the draw, but the more you enter the greater the chance of winning. Prize draw is open to anyone who is a member of YouGov’s UK panel. The prizes may change from drawing to drawing. All entries to be received by the closing date - this is always midnight on the last day of the calendar month. Winners agree to take part in future promotional activity. Judge's decision is final. No correspondence will be entered into. The names of the winners will be published on YouGov’s website pursuant to winners’ permission. Winners of 5 cash prizes will be contacted directly and will have 1 month to respond, or the prize will be redrawn. Winners of the points prizes will be automatically credited the points.